Arcooda Video Pinball is the world’s first full-sized touchscreen video pinball machine. 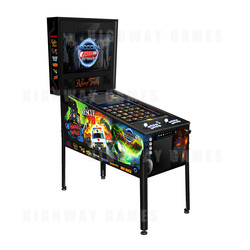 It is made with real pinball parts for an authentic pinball experience, and offers advanced features such as interchangeable control panels. With Arcooda Video Pinball, users have the ability to play 1000’s of video pinball and arcade games on the one machine. Unique features to this machine include: steel construction, 4K touchscreen, 4K 32inch backglass monitor, LED lighting individually programmable, Homepin Flipper Opto Boards, 8 coils, 2 shaker motors, 2 blower fans, 80amp power supply, internal Kinect 2.0 ready and PC: I7 8700, 16GB DDR4 RAM, 256gb Solid State HDD, Nvidia GeForce GTX 1070 (8gb GDDR5) and 1TB HDD (7,200 rpm).